At least six, and possibly seven people were killed Wednesday in a bombing next to a Shi'ite mosque on the outskirts of Damascus. The bomb, hidden in a garbage bag in the Sayeda Zainab district, wounded 13 others as it exploded. A second bomb in the area was defused, according to the semi-official Addounia television station. Opposition forces said that seven died in the bombing, which occurred near the office for Shi'ite Iraqi clergyman Muqtada al-Sadr, in a mixed Shi'ite and Sunni Muslim neighborhood. A top Syrian Air Force general was killed by opposition forces on Monday, government media reported yesterday. General Abdullah Mahmoud al-Khalidi was shot to death in the northern Damascus district of Rukn al-Din, state television reported. The general was killed Monday evening as he left a friend's home, a security source in Damascus told the AFP news agency, on condition of anonymity. The Free Syrian Army (FSA) claimed responsibility for the killing in a statement posted on the Internet. In its statement, the FSA said Khalidi was in charge of training and was an air force intelligence specialist. The government has intensified its air strikes against rebel-held areas in recent days. There were more than 60 air raids on Monday alone, according to the UK-based Syrian Observatory for Human Rights. For the first time, Syrian fighter jets struck targets within the capital city itself, dropping four bombs Tuesday on the east Damascus neighborhood of Jobar, near the rebel-held subrb of Zamalka. 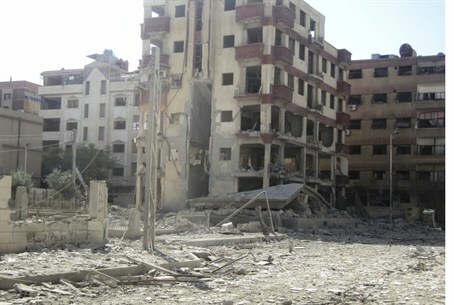 Activists said a Syrian Air Force fighter jet loyal to Syria's President Bashar al-Assad also fired missiles at Duma, near Damascus on Tuesday as well, leveling most of the buildings in the area.